Marketing makes football go round. Choose a single football product and develop a comprehensive content marketing plan for that product. We will pragmatically alter a few points to make it more adequate for a football setting, and we will limit the content palette to social media content. «Derby della Madonnina» (The Milan Derby). The product I chose for this exercise is a football match with a special twist or history: a derby, specifically, the Derby della Madonnina, also known as the Milan Derby. Football derbies attract lots of attention (ESPN, 2011) and offer football marketers the opportunity to reach a large, homogeneous and compact audience. In the case of the Derby della Madonnina between AC Milan and Inter Milan, the two crosstown rivals can attract both their fan camps into one and the same stadium at the same time. In this case, the opportunity to fill the stadium is even bigger, since both clubs call the 80,000-seats San Siro stadium their home. Basically, no team is ever really the away team in this derby. Furthermore, the derby has taken place 280 times, since its first edition in 1909, and offers a lot of historical material ready for marketing purposes. Step 2: Research and define the target audience. Demographic: Anyone interested in AC Milan, Inter Milan, and football in general. No age, gender or socio-economic restrictions. Behavioral: Football is an emotional matter. 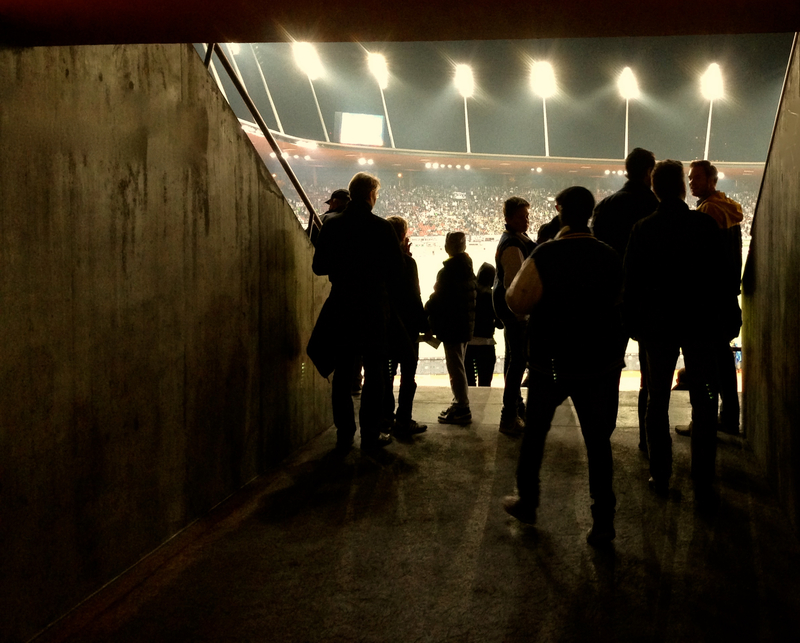 Everyone going to a football match has a preference in regard to which team (or player) should score and win. Therefore, content should be emotional and appealing to a friendly rivalry. Psychographic: It is said that football has historically risen from the past-time of blue-collar workers as it can be seen in the history of clubs such as Manchester United, PSV Eindhoven, Bayer Leverkusen, and Yokohama F. Marinos. For that matter, I suggest creating content appealing to a middle-class football fan. For this task we will use the AIDA-model as developed by E. St. Elmo Lewis. The model depicts a theoretical customer journey from the moment the content we produce for our Milan derby attracts consumer attention to the point when they purchase a ticket for the event. AIDA is an acronym and stands for awareness, interest, desire, action. Our content will raise awareness for the existence of the Derby della Madonnina (our product). —> This step can start a few weeks (5 to 6 weeks) before the event takes place. Standard banners in match day magazines or on the website, as well as tweets and instagrams can support this action. Additional content will deliver more relevant information in regard to our derby to the target audience. —> Here, like in the awareness stage, banners, tweets and instagrams will do the trick. Maybe a short vine or Instagram video can be added. I suggest starting the activities 3 to 4 weeks prior to the event. Content with emotional appeal will underline the desire to attend a legendary match with the potential for writing history. —> Video content will add a strong emotional aspect to the campaign; sweepstakes and community engagement will provide a tighter bond with the target audience and eventually the desire to experience such a legendary event will lead to the purchase of a ticket. I suggest to heat up the desire for purchasing the ticket 2 to 3 weeks prior to the derby. Our content provides all necessary information to buy tickets for an unforgettable Derby della Madonnina. —> A clear call-to-action that leads prospects to websites, phone numbers, stores and shops needs to be provided on all pieces of content. Buyers will feel the desire to buy and decide to take action on different times in the sales funnel. In order for us to be reachable at any point in time, the above-mentioned contacts need to be present on all pieces of content. A century old friendly crosstown rivalry that has written history over and over again with football highlights from legendary champions! The content will be found on a dedicated website – ideally also on a microsite – and all other digital media, as well as through both clubs’ traditional information channels (magazines, brochures, pamphlets, etc.). We will share our memories, stories, and emotions on 280 legendary Derby della Madonnina matches with AC Milan and Inter Milan fans, as well as with anyone who cares about Italian football. Furthermore, we want to inspire and educate them and provide a feeling of belonging to our community. History. One category of content will draw its content from history. We will go through the 280 times that AC Milan and Inter Milan played each other in the Derby della Madonnina and create banners and meme’s with said moments. Legends. Legendary duels between football champions have been played out during the Milan Derbies: Think of the Mazzola vs Rivera showdowns of the 1960s, or the Milan Dutch players vs the Inter Germans in the late 1980s. City branding. The city of Milan can benefit from stadium visitors traveling to San Siro from the suburbs and outside the city. In this case, a close collaboration with the Tourism Agency of Milan could boost attendance and facilitate the spreading of information about the derby and the already produced content. Sponsor activation. Even though sponsor activation is ideally an ongoing process, a special event such as the Derby della Madonnina could be an extra strong incentive to produce content. Just by considering the clubs’ kit sponsors: AC Milan’s kit sponsor Adidas could produce content involving one of their recent stars, like Keisuke Honda, and on the other side, Inter Milan’s kit sponsor Nike could respond by involving one of their more established stars, Yuto Nagatomo. Contemporary rivalry. Continuing from the idea above, banners or other vehicles that portray a (obviously friendly) rivalry between two opposing players of both teams, that have a certain connection with each other, could kick-start the desire to attend the derby. My first thought is to include Nagatomo and Honda in a campaign. Both players are established players in their respective teams, are teammates in the Japan National Team, in addition, Nagatomo being a more defensive player and Honda being a more attacking player might even clash with each other on the pitch. This setting could provide loads of emotional, enticing, and potentially viral content for social media, if produced with the right angle in mind. Click here to download a sample content marketing plan spreadsheet with a few ideas. Continuing from step 7, I scheduled some content ideas as mentioned in step 4. 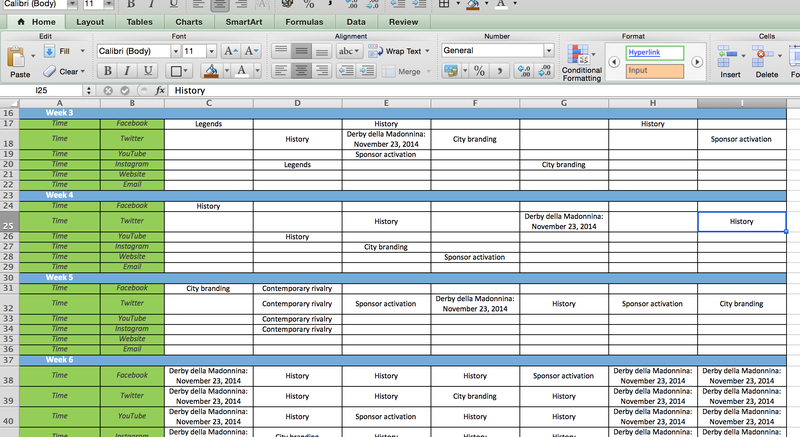 Below you see a screenshot of the spreadsheet I used for scheduling. Click here to download the schedule. Since our pieces of content are banners, photos, and videos that are meant for social media usage, we do not need an actual strategy on how to market that content. The main brainwork happens in step 7 and 8, where we have to conceptualise all necessary content needed to bring our messages across to the relevant target audience and decide through which social media we want to spread those messages. Benchmarks for the above-listed KPI’s have to be set or calculated by the campaign manager. I suggest taking the average from previous similar campaigns for all respective social media platforms and try to be above that average (=benchmark). As for measuring the goals set, it is advisable to use the analytics tool that come with the platform, such as YouTube Analytics, Facebook Insight, etc. I found this to be a fun exercise. Even though it requires quite a bit of research and of making assumptions, it teaches what kind of content can or should be produced in order to promote a product or an event on social media. So, what product do you choose for this exercise and what content would you create to promote it? most up-to-date and previous technologies, it’s remarkable article.